The lovely thing about the Twin Cities is the constant arrival of new theater companies. Everyday I feel like I get a new release about from a company I haven’t heard of, whether they are new or just the fact that there are really that many. Last year I saw a new production by one of the Twin Cities newest companies, started by Tyler Michaels and Tyler Mills, called Trademark Theater. 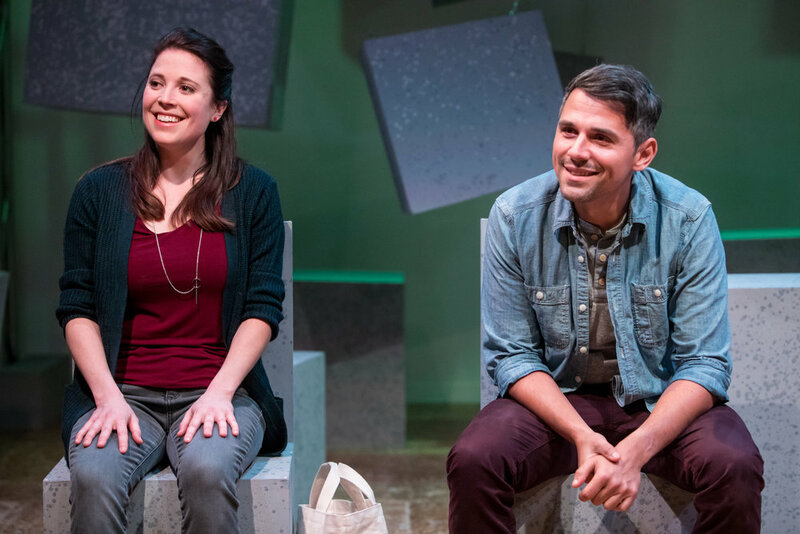 This past week they opened their second season with a world premiere of Mills’ newest play titled Understood in which I was able to see the first preview performance of. This is the second thing I’ve seen that Tyler Mills has written. The first was The Boy & Robin Hood which I raved about. It was dynamic, original and refreshing. It was a play with music that told a new story of Robin Hood, a story of almost fantasy proportions. Now this play takes a different approach with a more realistic setting and plot. It’s a testament as to how great of a versatile writer Mills is. It’s rooted in realism and feels natural with the arguments and the overlapping dialogue. The themes of the show also are pertinent with the world we live in today as it talks about LGBTQ issues, civil rights, gun rights and religion. Trademark Theater know exactly what they are doing and even admitted that they consciously scheduled the run of the show leading up to the midterm elections. This is the theater I live for. When theater has a cause and is relevant to the times. The smaller and intimate space helps add to the naturalness of the pieces because we, as the audience, are so much closer to the actors. Seeing every twitch, eyebrow raise, and eye roll makes the play feel so much more heightened. The set includes two abstract looking chairs with a matching table and then various cubes hung up from the ceiling. The show utilizes them well and weaves in various black outs with perfectly synced sound cues to give a jarring effect when the black out occurs. Shout out to the lighting designer Karin Olson and the stage manager Lisa Smith on these aspects. Tyler Michaels serves as Trademarks artistic director and director of the show. He’s cast two perfect performers for the parts which each offer two roles. Since the show is in such an intimate space, there is no place for them to stop and think apart from those few quick black outs. They are completely in their element and on their A game the entire show. Adelin Phelps plays both Julie and Rachel while Sasha Andreev plays Chris and Josh. Their ability to flip back and forth between each character and each scene – which happens a lot including various time skips in the main couples’ relationships – is incredible. Their performances are true and genuine with awkward pauses and all. My only critique is that because the show moves at such a fast pace with the scene changes, it was difficult at first to realize and remember when each actor was playing Julie/Rachel or Chris/Josh. At times I was a bit confused hoping that one character would say the others name, or maybe a small feature on their costume would help me remember when they were playing each character. Trademark Theater continues to make a name for themselves with this second world premiere. The show is gripping, raw and though-provoking. Overall, it’s a great piece to see and a great time to see it when we live in such a polarized society. The two shows I’ve seen at Trademark really help show their range and what they are willing and able to do. It only makes me even more excited to see what else comes out from them and how they position themselves in a city where art thrives. Understood plays at Soma Studios through Trademark Theater now through October 28. Tickets can be found below along with more interviews by both performers on the Trademark Theater website.